David Livingstone and the Other Slave Trade, Part I. 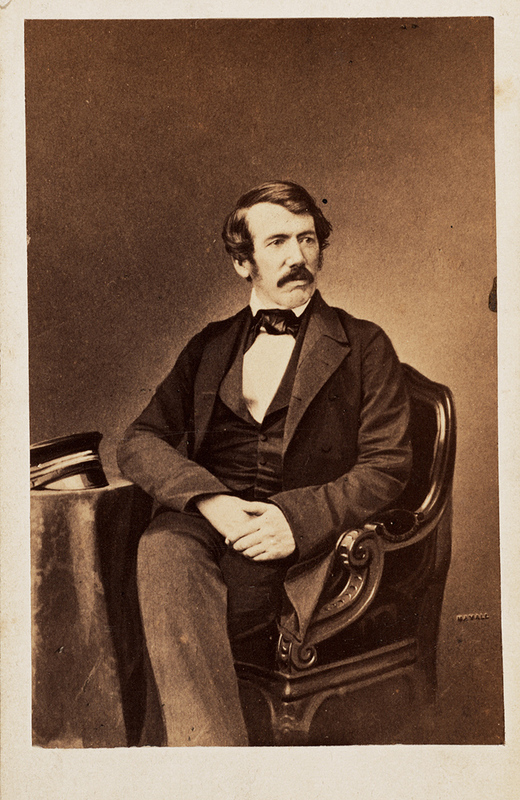 2013 marks the bicentennial of Scottish explorer David Livingstone (1813-1873). His explorations in central Africa are well known – – “Dr. Livingstone, I presume.” Less well known is his first-hand encounter with the horrors of the Arab slave trade in East Africa. Two Smithsonian Libraries – – the Warren M. Robbins Library at the National Museum of African Art and the Joseph F. Cullman 3rd Library at the National Museum of Natural History – – have exceptional collections on David Livingstone and 19th-century African exploration. 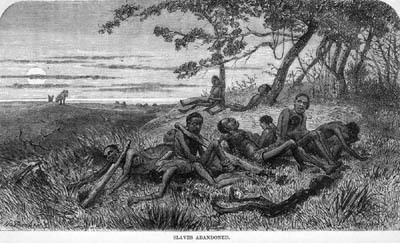 Drawing upon our Smithsonian Libraries’ resources, volunteer Judith Schaefer recounts David Livingstone and the other slave trade. Thus did David Livingstone realize early on that slavery ruined not only the lives of the enslaved but also the character of the men who owned and traded them. This fearless, independent, strong-willed Lowland Scot, a medical missionary by training, believer in hard work and the doctrine of “Self-Help,” first encountered the reality of slavery in southern Africa, in the region known now as Botswana. In 1847, he and his wife established a mission there among the Bakwena people, where he made his only convert— Sechele, the king of the Bakwena. This extraordinary man, who quickly learned to read and write, eventually spread Christianity more effectively than the dour Scotsman ever did, for Livingston’s religious zeal was soon combined with another cause. That same year, Livingstone set out to explore the vast Zambezi River basin. He first traveled west, through Portuguese Angola to the coast. Even though the infamous Atlantic slave trade had been abolished in 1803 and 1837, the demand for slaves persisted, mainly in Brazil, and Portuguese slavers were encountered along the way, driving their wretched booty to market, made a lasting impression. A slave caravan. 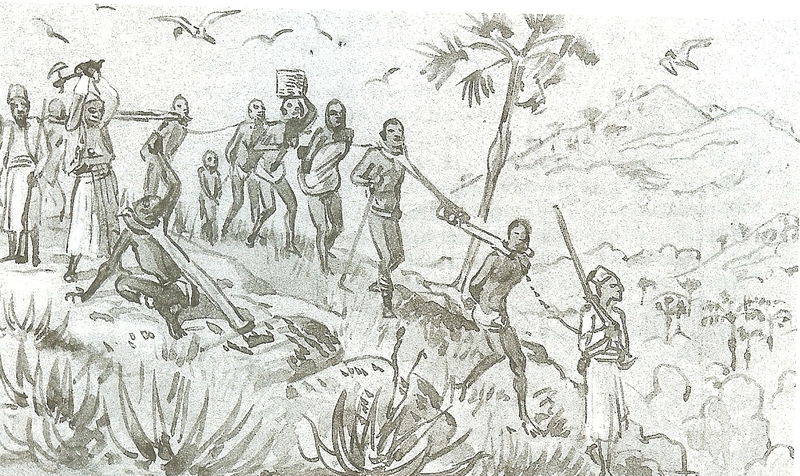 Sketch by Livingstone. The trans-Atlantic trade was, of course, not news to Livingstone, but what he saw next, following the Zambezi River back downstream all the way to the Indian Ocean and the Portuguese colony on the coast, was an unhappy surprise. Africans in the interior were trading slaves to the Portuguese, who sold them to Swahili and Arab traders in Mozambique, who in turn sent them to markets throughout the Arab world. It was easy money, inducing Africans to ignore the natural wealth around them, such as deposits of coal, iron ore, copper, all evident to a European eye. 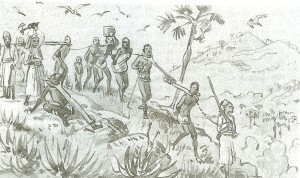 Gang of captives met at Mbame’s on their way to Tette. (Engraving based on Livingstone’s sketch.) David and Charles Livingstone, Narrative of an Expedition to the Zambesi and its Tributaries; and of the Discovery of the Lakes Shirwa and Nyassa, 1858-1864 (London: John Murray, 1865). Livingstone realized that simply making the slave trade illegal wouldn’t solve the problem. Africans needed a different economy, one based on legitimate African products and requiring infrastructure. In talking with my companions over these matters, the idea was suggested that, if the slave-market were supplied with articles of European manufacture by legitimate commerce, the trade in slaves would become impossible. It seemed more feasible to give the goods, for which the people now part with their servants, in exchange for ivory and other products of the country, and thus prevent the trade at the beginning, than to try to put a stop to it at any of the subsequent steps. This could only be effected by establishing a highway from the coast into the centre of the country. Development of infrastructure to stimulate trade is, to this day, a concern throughout the continent. Critics might argue that this would still be a form of exploitation of Africa by Europe. But it was a more civilized way of exploiting people than destroying or taking its strong men and women across the seas to slavery. . . . The core of Livingstone’s point of view was the relevance of economic arguments to moral issues. Stay tuned for Part 2 in this series! David Livingstone, Missionary Travels and Researches in South Africa (London: John Murray, 1857). Maurice Boucher, ed., Livingstone Letters, 1843-1872: David Livingstone correspondence in the Brenthurst Library. (Johannesburg [Houghton] South Africa: The Brenthurst Press, 1985), 69. Refer to http://myreadingmapped.blogspot.com/2013/02/livingstones-trans-african-expedition.html for an interactive Google Map of the expedition. Ibid., image reference: knox 02. Quotation from Horace Waller, ed., David Livingstone, The Last Journals of David Livingstone, in Central Africa, from 1865 to his death (London: John Murray, 1874). 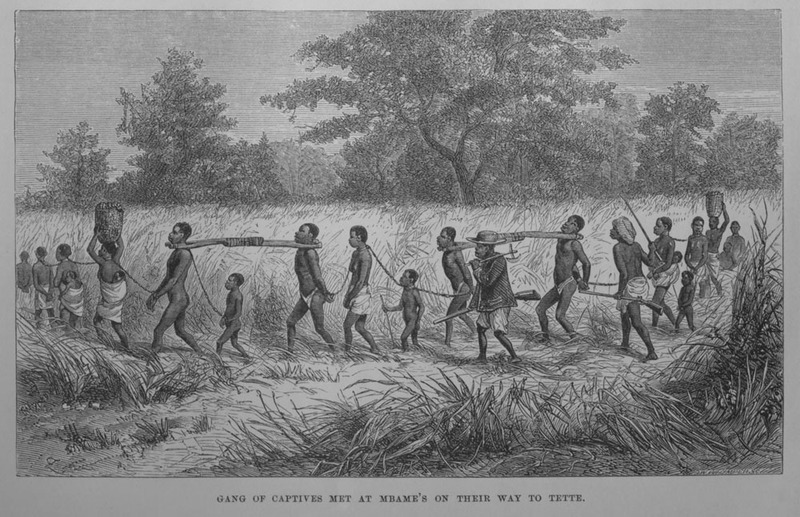 Livingstone, Missionary Travels and Researches. A. Ross, David Livingstone, 90. Fidelis Nkomazana, “Livingstone’s ideas of Christianity, commerce, and civilization,” Botswana Journal of African Studies 12, (1998), 1 and 2. Thank you for listing MyReadingMapped’s Google Map of Dr. Livingstone’s Trans-African Expedition as citation number 4. By doing so you helped to give my site credibility. I suspect that in Part 2 of your series you will want to add MyReadingMapped’s Google Map of Dr. Livingstone’s Source of the Nile Expedition which is as you will see is a very complicated route and is integrated with, and linked to, MyReadingMapped’s Google Map of Stanley Finds Dr. Livingstone to show where each was at various times in their adventure and how they finally came together. Also, each of these maps is based on an eBook written by each explorer and can be read while viewing the map which cites each location by page number and a quote from the eBook which can be obtained by a link on my website. In addition each map also has a Google Earth KML file that enables you to digitally walk the map from location marker to location marker. Update: the Dr. Livingstone Source of the Nile map referred to in this article has been moved to a new web site that has the ability to render the map in 3D online and has the staff and know how to keep it functional. All 160 MyReadingMapped maps are now located in the educational section of http://climateviewer.org/. It is not without a sickening feeling in my stomach, that I read anything about slavery. I certainly admire David Livingstone’s courage to take up this noble fight against the slave traders, as well as the Boers. Thank you for this short, but very informative article. I am at this moment reading his Correspondence of 1841-1856 to LMS. What a brave Scott he was! I would, however, like to see the names of the 124 children, that the Boers had taken from Sechele. Can you assist me with that? Thanks again. It is actually sickening, to say the least. Savages, they were, yes. But humans, with souls; the breath of God. Congratulations fot this post, Sir. I have a doubt about it: are you sure Dr. Livingston wrote that “Africans in the interior were trading slaves to the Portuguese, who sold them to Swahili and Arab traders in Mozambique, who in turn sent them to markets throughout the Arab world”? Can you please point the source of your statement?